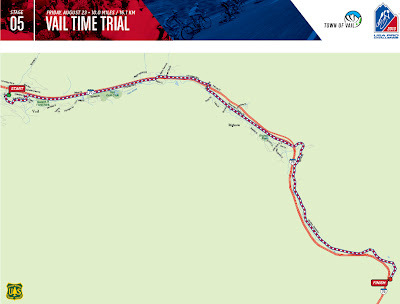 The big day for fans has returned - the Individual Time Trial on Vail Pass is back! 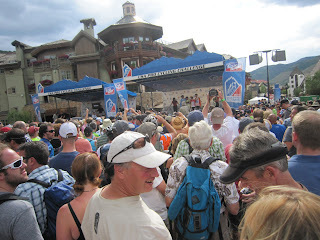 We were there in 2011 for the USA Pro Challenge. I say we because I am sure you were there too, you wouldn't have missed that one. If you did - which I still deny - you can make up for it by getting out and going to the race this year. No excuses, except for work, but that is what vacation days are for. This year the Vail Pass time trial falls on a Friday, just two short days before the final day in Denver, Colorado. It is time to round up your friends (or ride solo because you will definitely meet people on the pass) and head for the hills. Hours of entertainment await you as rider after rider race past you on either a modified road bike or a full out spiffy time trial bike up a narrow road to 10,000ft in altitude. A true test of man and his machine. 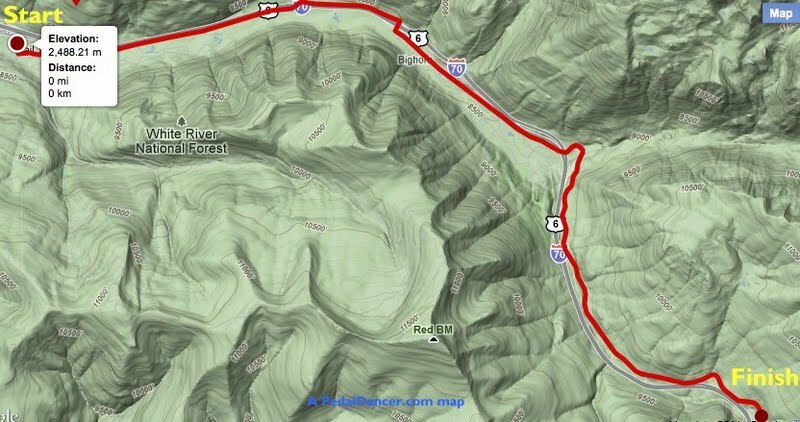 This course was inspired by the Coors Classic route raced upon the same road in 1988. The USA Pro Challenge first (and last) visited this time trial course in 2011 in its inaugural year. There will be an amateur time trial run on the course before the pros race, so be aware of cyclists coming through (Price: $1500, space is limited, register). In town, expect the typical Vail Village atmosphere with Festival and start ramp action. 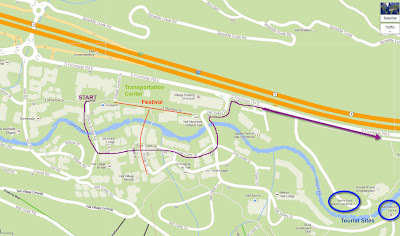 Racers start by heading West from Solaris Plaza on Meadow Drive in Vail Village. 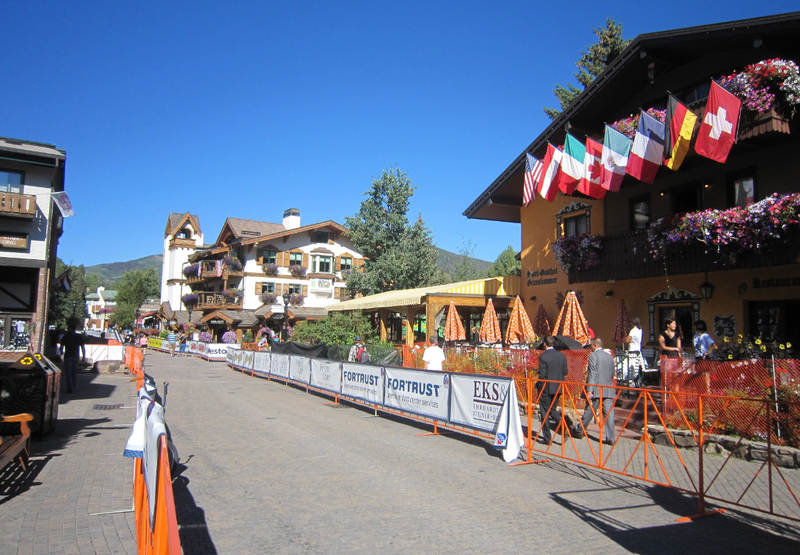 Turning south onto Willow Bridge Road, then the race heads east at Checkpoint Charlie onto Gore Creek Drive through Vail Village. 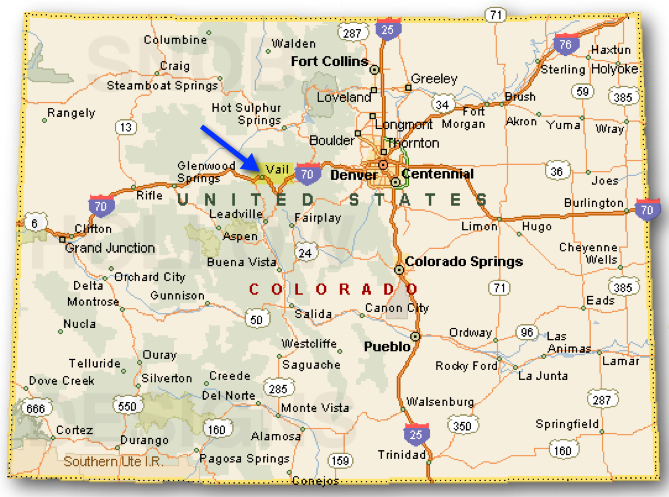 They turn north onto Vail Valley Drive and proceed up to the South Frontage Road East where they turn east paralleling I-70. 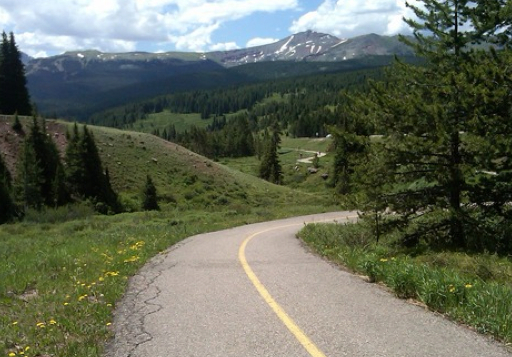 This road continues for just over 3.5 miles to East Vail and becomes Bighorn Road. 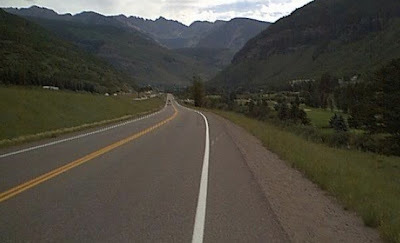 Racers continue east on Bighorn Road for approximately 2 miles until it becomes the Old Highway 6, which is no longer used for vehicular traffic. It heads 4 miles uphill on Vail Pass to the cul-de-sac. Pedal Dancer® comments: Lots is at stake on this day. The top riders will be racing hard. The riders will definitely need to warm up for this short punchy time trial up hill at altitude. Expect to see the riders out on course before the start and warming up on the rollers at their hotels or near the team bus. A 10-mile uphill at altitude time trial is going to hurt. Seconds matter and if you have any doubt about the intensity of this race, watch this video: Tejay van Garderen after completing the Vail ITT in 2011. Stage results from 2011. Get to the area early for prime parking. 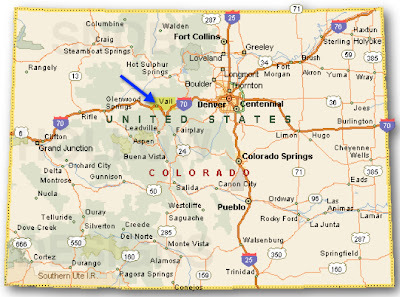 I-70 westbound will be reduced to 1-lane and will cause slowing over the pass. The team cars will use the right hand lane to circle back off the pass into town. Some off-ramps will also be closed, a complete list of local road closures & parking for Vail Valley for the USA Pro Challenge on August 23, 2013. The weather will be mild on race day 60s-70s with rain forecast. Bring a rain jacket. This is basically a one-way time trial. 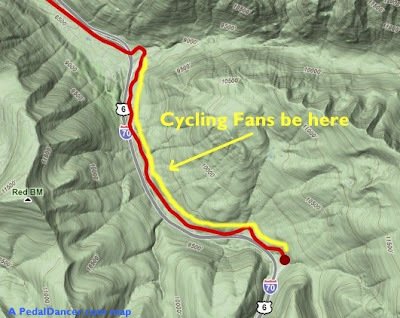 Fans that are on the pass will be there until the last rider finishes before being able to descend to Vail, so enjoy the day in this beautiful Colorado setting. 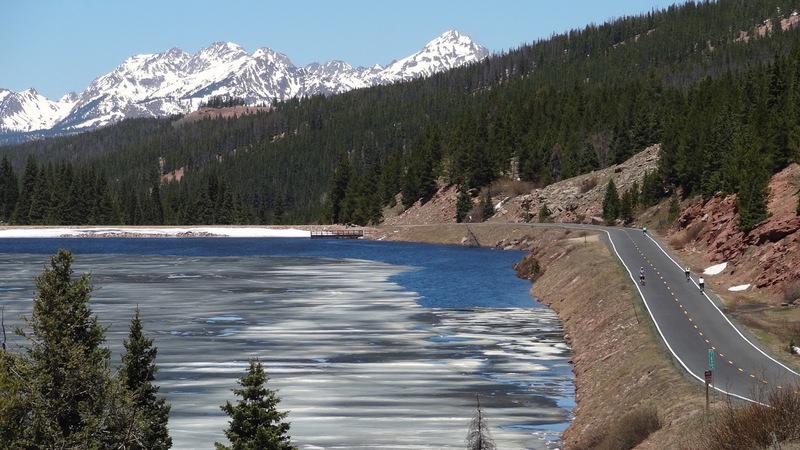 The last miles of the ITT will be THE scene for cycling fans at the finish near Vail Pass. You will not be able to drive within 3 miles of the finish, so please bike or walk. Shuttle vans will be provided from town to the base of the climb (a no vehicle bikes only zone all year round). Bring food and water (no source nearby) and a jacket. Expect large numbers of fans on the climb up Vail Pass, so pedal and arrive early. Two years ago I was riding up the final stretch of road and heard the unmistakable sound of deep dish wheels behind me only to look and see Ivan Basso passing to my left. So cool. 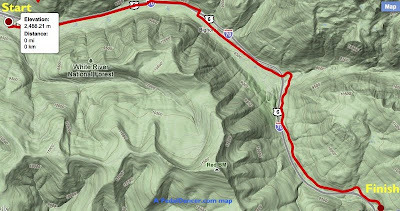 Since the route is only ten miles long, you will likely see teams out scouting the course in the morning as their pre warm-up. 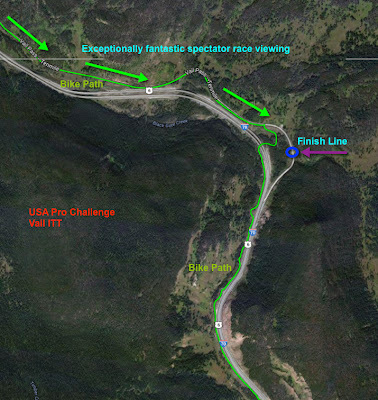 The first rider (technically the last on GC standings) will begin in Vail central at 1:05pm. Riders will be spaced 60 seconds apart, the last 10 riders (top GC) will be 2 minutes apart. Teams arrive at around 11-11:30 in town, you will see riders warming up on their spinners near their team buses prior to their set start times. There are weigh-ins but no sign-ins at Time Trials. Please do no paint on the road, only chalk. Please do not run next to the riders. The passage is very narrow and you are endangering the riders while really miffing off fellow spectators. And the team cars need to get by safely. Remember that what goes up must come down. The team cars do accompany riders up the pass and exit further up the trail entering I-70 for the return to town. The team cars will take with them the earlier riders. In 2011 some of the riders and the cyclists returning to the Vail side, rode back down on the path/road together into the town of Vail. It was thrilling to ride alongside the pros and realize you could keep up with them if you pedaled as hard as you could and they coasted. Depending on how far up the pass, you had nestled in for your key viewing spot during the race, fans had time in 2011 to return to watch at least part of the podium awards in the center of the Village. I like watching individual time trials for the bikes and for the anticipation of action off the start ramp, but Stage 5 offers the rare combination of being able to walk up or ride out on course in a spectacular setting a mere ten miles from the start line. 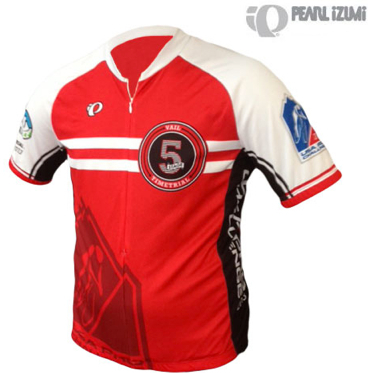 This is a day to ride to the top on your mountain bike or road bike. Bring food and water, and wear your casual shorts, tshirts (rain jacket, just in case) sunscreen and comfy shoes. You will spend far more time hanging around than you will walking to or riding to this stage. Racing action is from 1:05-3:45pm approximately. 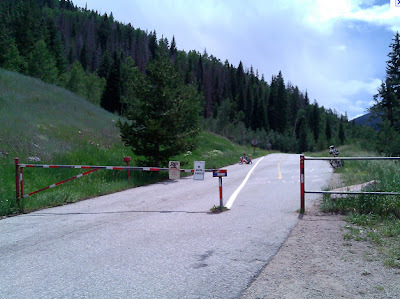 Photos of the Vail time trial roads, ten miles from town to the top. Layout of the finish area on Vail Pass and the (green route) bike path approach from both sides. Map by Pedal Dancer. 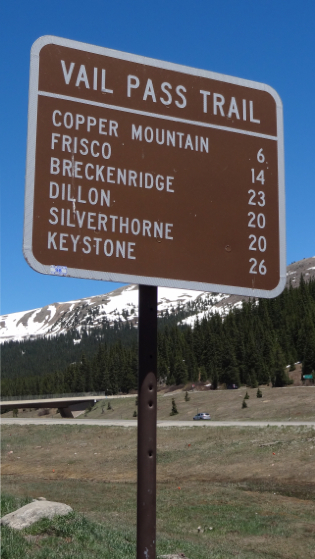 Ride west into Vail over Vail Pass, from Frisco to Vail the mileage is approximately 27 miles one-way. 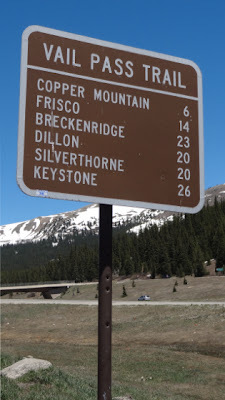 The ride is easy from Frisco to Vail (except for 3 steep switchbacks), but a steep climb back from the point of the finish line on Vail Pass to Frisco. 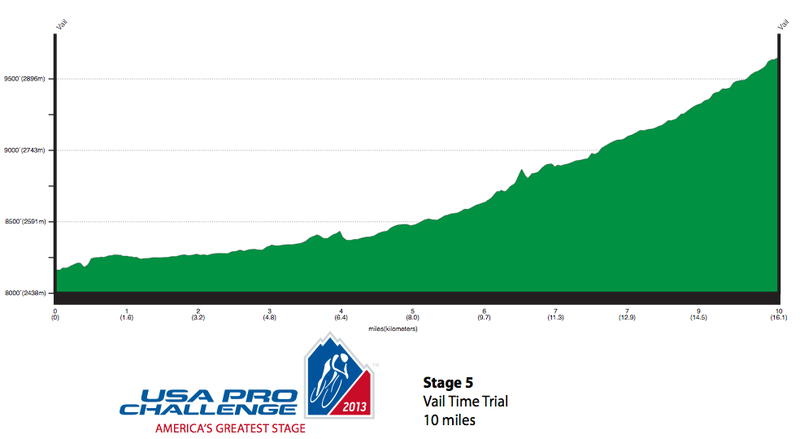 Sign-up to help out at the race for Stage 5 in Vail. I would go straight to https://www.room77.com and look for the best Hotel deal in Beaver Creek, Avon, Edwards or Vail, Colorado, for the evening after Stage 4 and you will be perfectly poised to enjoy Stage 5 and the Individual Time Trial up Vail Pass the next day. 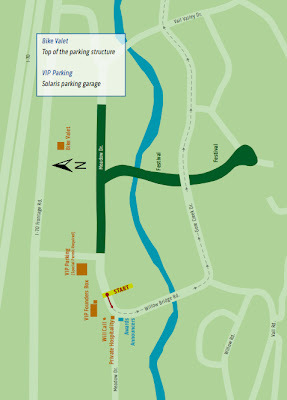 The Betty Ford Alpine Gardens, 183 Gore Creek Drive, Vail; open from dawn to dusk. Free. The Vail Nature Center is nearby.